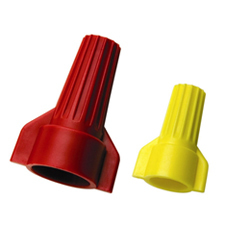 The company’s Twister PRO, for instance, is a red/yellow wire connector that features a patented overmolding to provide improved leverage and more torque, as well as better grip and more leverage for faster connections. The connector can handle wire range and capacity up to a maximum of 4 #10 wires in a single connector. IDEAL’s Twister is the connector recommended for most common wiring configurations for residential construction projects, featuring a hex-top to allow for 5/16” nut driver application and a copolymer shell that expands for progressive tightening and allows for quick uptake on combinations including solid-to-stranded. The company also offers a smaller-profile Twister LT for recessed light applications that may be harder to reach into. The Wing-Nut wire connector from IDEAL also has an expanding copolymer shell as well as expanding, square-wire springs to accommodate a wide range of wire sizes and combinations. Its contoured wing profile provides extra leverage for maximum torque. The Wire-Nut is the connector that IDEAL calls “an American classic” and “the connector that started it all.” Five color coded modules of the Wire-Nut cover wires ranging from #22 to #6, featuring a positive-grip shell design, square-wire fixed spring design to create its own threads to create lasting grips even for fine stranded wire applications. The company also offers its “B-CAP” wire connectors for hard-to-reach spots, often encountered in retrofit or upgrade opportunities. The space-saving cap profile works well in shallow boxes, while the B2 universal connector can handle two #18, up to five #12 or even dead-end a single #14 wire. The company combines many of these connector properties in other offerings such as its B-Twist, Wing-Twist and Wire-Twist products, and also has weather-proof connectors sealed with a silicone-based sealant to remove the need for heat-shrink or excessive taping after the connection is tightened. Finally, IDEAL manufactures its UnderGround connector made specifically for harsh under-ground environments and conditions including below-grade wet and direct burial applications. The connector is UL listed to 486D for such applications, and offers a deep skirt to provide moisture resistance and a tough thermoplastic shell to provide corrosion resistance as well as protection against accidental impacts. All of these connectors, plus the company’s aluminum-to-copper connector, called the Twister AL/Cu can be found on the company website and are available through qualified distributors.